Search Marketing (SEM / Search Engine Marketing) is a form of Internet marketing that involves the promotion of websites by increasing their visibility in search engine results pages (SERPs) primarily through paid advertising. SEM may incorporate search engine optimization (SEO), which adjusts or rewrites website content and site architecture to achieve a higher ranking in search engine results pages to enhance pay per click (PPC) listings. In 2007, U.S. advertisers spent US $24.6 billion on search engine marketing. In Q2 2015, Google (73.7%) and the Yahoo/Bing (26.3%) partnership accounted for almost 100% of U.S. search engine spend. 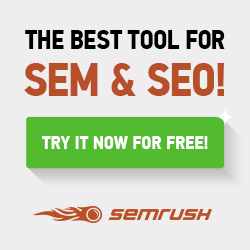 As of 2006, SEM was growing much faster than traditional advertising and even other channels of online marketing. Managing search campaigns is either done directly with the SEM vendor or through an SEM tool provider. It may also be self-serve or through an advertising agency. As of October 2016, Google leads the global search engine market with a market share of 89.3%. Bing comes second with a market share of 4.36%, Yahoo comes third with a market share of 3.3%, and Chinese search engine Baidu is fourth globally with a share of about 0.68%.